I love spicy food and tomato, yet never thought about combining these two things together until I came across a Chinese food magazine that was printed in the good old days (1980’s). It enticed me to try. The first time I put this spicy baked pork chops on our dining table, my daughter finished the most. Since then she asks me to make her this dish every now and then. She always starts with something like this, “Mom, you haven’t made spicy baked pork loin chops for a long time.” Actually, it’s just a few weeks ago, she did have one. Hmm…. Rinse, peel, seed and dice the tomatoes. Dice onion. Mix the marinade ingredients. Use a teaspoon to spread the marinade on both sides of the pork chops. Marinate for 2 hours. Melt butter with oil in a frying pan. Fry pork chops on both sides and arrange on roasting tray. Fry onion till translucent. Put on top of pork chops. Sprinkle with the diced tomato and seal with tin foil. Roast in preheated oven 200C (375F) for one hour. Remove the tin foil and cook to reduce the juice. Serve hot. Just brown the pork chops in a frying pan as they will be cooked through in oven. You may skip peeling tomato skins. Thick pork loin chops is preferably used to get the best results. A ceramic baking tray is good to retain moist as a result that the pork meat will be juicier. If you’re in a rush, you can pan-fry the pork chops right away after spreading the marinade on them. 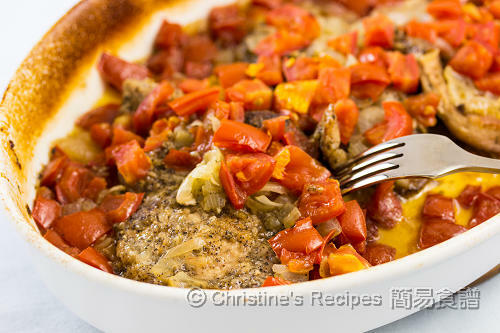 This recipe is updated with new photos, first published on 31 July 2008. I love spicy food too. 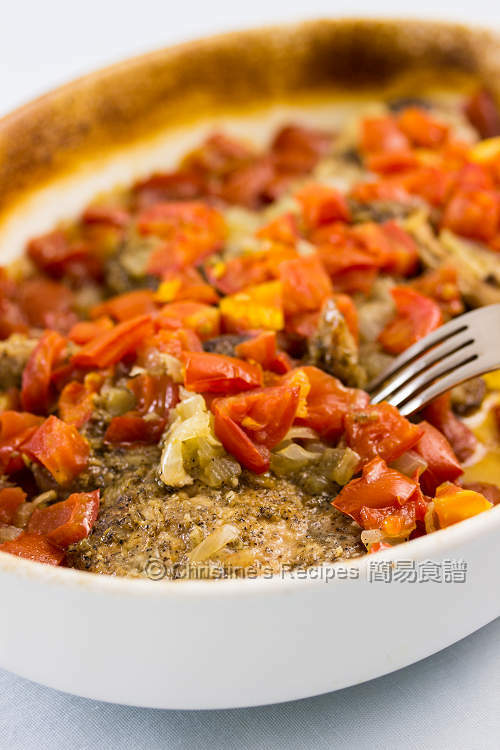 This looks really tasty and it seems not too difficult to prepare too.